Huy Dang and Arsen Nikiforouk come from very different corners of the Earth, but they both know what it's like to live a hard, destitute life. One grew up in the Ninh Thuận province of southern Vietnam - the country's poorest and least industrialized province. The other was raised in the rural village of Illintsi, Ukraine. Still in their early twenties, the two's paths crossed at Philadelphia's Drexel University, where they studied on scholarships and interned as business analysts. Now the two are looking after their joint start-up, which seeks to develop "a systematic business model that helps fund selected charities" and help those who need the most. It goes without saying that the two are grateful for the chance Drexel University gave them and probably aspire to do the same. Their first project is Turtle Rock - a simple, bare-bones iOS game that collects charity funds from advertisements and player's achievements. It requires lots of concentration to play, and it probably won't keep your attention for very long, but nevertheless, knowing that playing it does good to people in need contributes a significant amount of joy. For starters, Huy and Arsen have partnered up with a charity in Vietnam that provides medical aid to children, along with well-known charities. The two will donate all profit from ads to charities along with an additional $20 when a player advances past the 200 mark in the game. 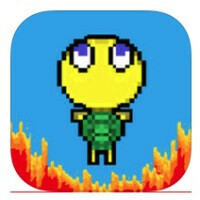 If you want to help the effort by devoting some gaming time and practicing your reflexes, you can download Turtle Rock for free from the Apple App Store. Many of these apps are scams in disguise. It wouldn't surprise me if this one is too.